A common but unidentified Falkland Islands sponge. Identifying sponges is not as easy as identifying, for example, dolphin species. Many sponges can appear similar to human eyes when in fact they are different species entirely. Work on their taxonomy is minimal and a comprehensive field guide is non-existent. In fact, the only existing survey of sponges within the Falklands is a 1932 report by Maurice Burton, a curator at the British Museum (now Natural History Museum, London). However, Burton’s specimens were all collected by dredge and these broken and lifeless samples were thus entirely unrepresentative of the in situ appearances of these animals. Dr. Claire Goodwin gives a public presentation on sponge taxonomy. In situ appearances, though, can complicate sponge identification. The colour, shape and form of a single species can vary dramatically depending on living conditions such as depth and current. Conclusive identification is instead done by dissolving part of the animal to look at the composition, shape and size of the skeletal structures, or spicules, within. 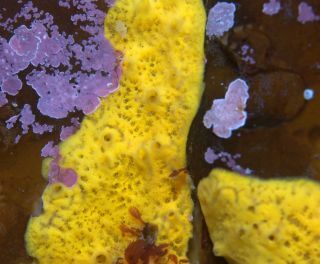 Only with this knowledge can differences in sponge morphology be resolved and the variety of forms be attributed to the correct species. 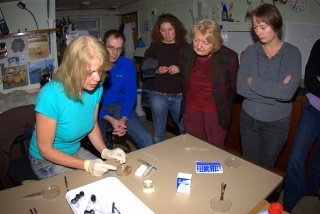 Jen Jones demonstrates sponge spicule preparation. 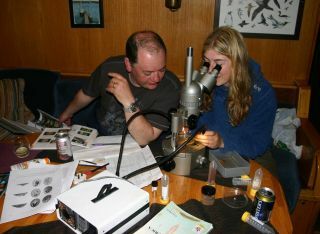 Knowing that sponge taxonomy in the Falklands would best be resolved with the presence of an expert, the SMSG offered sponge specialist Dr Claire Goodwin the opportunity to join in an extended expedition. Dr Goodwin is a marine biologist with the National Museums of Northern Ireland where she is responsible for the Sponge Biodiversity of Rathlin Island Project. This island, a key site for sponge species in Europe, contains over 130 species of this phylum, many of which were discovered and described by Dr Goodwin and colleague Dr Bernard Picton. Dr Goodwin has also surveyed sponges throughout the UK and her ability to recognize different taxonomic groupings of these animals gives her a global advantage in identifying this phylum. Jen Jones collects a sample from a sponge at 20 meters. Working alongside Dr Goodwin was Jen Jones, also from the UK. 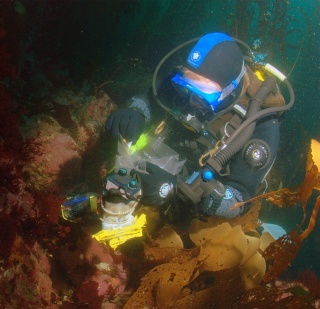 Ms Jones is a highly experienced scientific diver, participating in fieldwork on numerous subjects within the UK and beyond. WIthin this breadth of knowledge, her particular taxonomic interests lie in nudibranchs and sponges. These two seemingly distinct animal types are related in that their predator-prey relationship is often exclusive and identification of the colourful sea-slugs is often aided by identification of their sponge prey. Dr Goodwin and Ms Jones have worked extensively together in the field in the UK, and their teamwork extended to their time in the Falklands. Dr. Brickle and Dr. Goodwin aboard the Golden Fleece. Dr Goodwin received travel funding in the form of a Shackleton Scholarship (www.shackletonfund.com). This scholarship, set up in 1995 to commemorate Sir Ernest Shackleton and his son Lord Edward Shackleton, provides successful applicants the means to travel to the Falklands for research on the natural or social sciences. Many of Ms Jones's costs were covered by the BBC, which required the training of SMSG skipper Dion Poncet to a Divemaster level for an upcoming expedition of their own. In addition to her scientific background, Ms Jones owns the West Wales Diving School and holds numerous SCUBA and dive instructor certifications that enabled her to provide this training and also made her a valuable member of the expedition team. The sponge taxonomists meet His Excellency Alan Huckle.The duo spent their first week on the islands running SCUBA training sessions, collecting sponges and educating the public about themselves and their specimens. They featured in a newspaper article, spoke on local radio and led a well-attended sponge-identification workshop in which participants actively created microscope slides of the skeletal fibers for examination. With the publicity behind them, the two sponge experts and the SMSG team loaded up the yacht Golden Fleece and set out for the remote northwestern Jason Islands. Over the course of ten days and eleven dive sites (plus an additional five sites visited near Stanley), the duo took photographs and sample sections of 134 sponges. Though conclusive identification will have to wait for lab results in the UK, initial analyses have confirmed in excess of twenty-five different species, with one of the Hymedesmia species likely to be new to science. Upon the group’s return from the Jason Islands, Dr Goodwin and Ms Jones concluded the trip with another week in Stanley during which they packaged and prepared their samples for the trip to the UK. 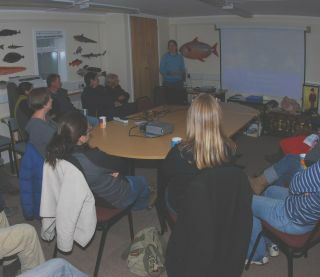 They also gave another very well attended public talk that incorporated information gained during the expedition regarding the sponge fauna of the Falklands. 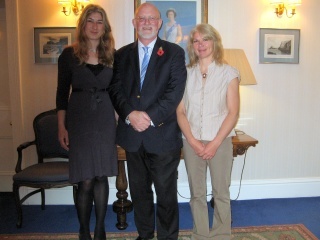 And in their final official act as sponge ambassadors to the Falklands, the two visiting scientists were the guests of honour at a Government House reception. 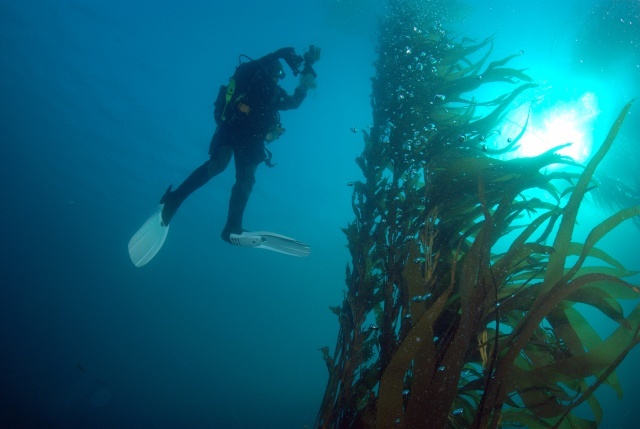 Jen Jones ascends through a kelp forest after a sponge collection dive.